The most universal civilian privation in World War II Britain, the blackout possessed many symbolic meanings. Among its complicated implications for filmmakers was a stigmatization of film spectacle--including the display of "Hollywood women," whose extravagant appearance connoted at best unpatriotic wastefulness and at worst collaboration with the enemy. Exploring the wartime breakdown of conventional gender roles on the screen and in the audience, Antonia Lant demonstrates that many British films of the period signaled their national cinematic identity by diverging from the notion of the Hollywood star, the mainstay of commercial American motion pictures, replacing her with a deglamourized, mobilized heroine. Nevertheless, the war machine demanded that British films continue to celebrate stable and reassuring gender roles. Contradictions abounded, both within film narratives and between narrative and "real life." 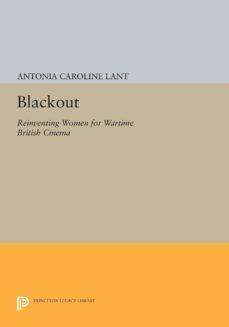 Analyzing films of all the major wartime studios, the author scrutinizes the efforts of realist and melodramatic texts to confront womens wartime experiences, including conscription. By combining study of contemporary posters, advertisements, propaganda notices, and cartoons with consideration of recent feminist theoretical work on the cinema, spectatorship, and history, she has produced the first book to examine the relationships among gender, cinema, and nationality as they are affected by the stresses of war.Originally published in 1991.The Princeton Legacy Library uses the latest print-on-demand technology to again make available previously out-of-print books from the distinguished backlist of Princeton University Press. These paperback editions preserve the original texts of these important books while presenting them in durable paperback editions. The goal of the Princeton Legacy Library is to vastly increase access to the rich scholarly heritage found in the thousands of books published by Princeton University Press since its founding in 1905.